Click on the link below to play "Win-A-Row" (CPM). 1. 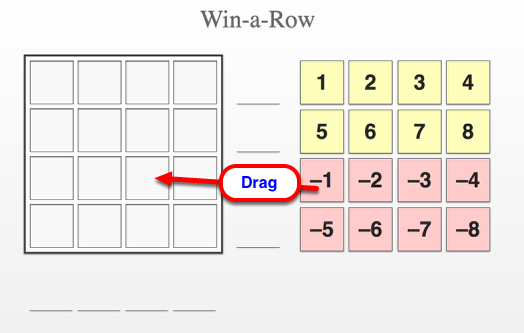 Drag the yellow and green numbers to the Win-A-Row grid. Play one round of rock-paper-scissors to determine who plays first. Player 1 places one of the numbers 1, 2, 3, 4, 5, 6, 7, or 8 in the square he or she chooses and then crosses that number from the list. Player 2 places one of the numbers –1, –2, –3, –4, –5, –6, –7, or –8 in another square and then crosses that number from the list. Alternate play until all squares are full and all of the numbers have been crossed off the list. Add the numbers in each row and write each row’s sum on the appropriate blank in the “Sum” column. Give the winner of each row one point. Add the numbers in each column and write each column’s sum on the appropriate blank in the “Sum” row. Give the winner of each column one point. 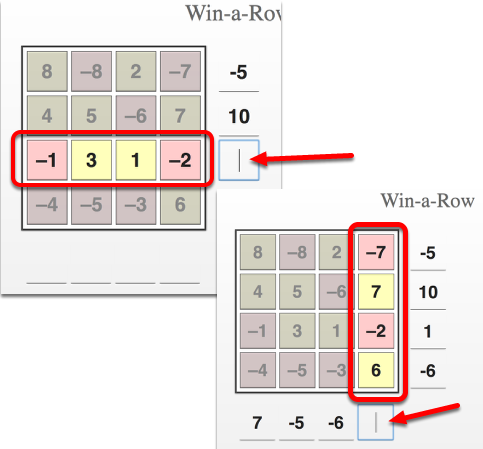 If the two players tie after adding the rows and columns, find the sum of the diagonal (from top to bottom and left to right) to decide the final winner. If the two players’ sums are still tied, find the sum of the other diagonal (from bottom to top and left to right) to decide the final winner. If the game is still tied at this point, both players win! 2. To sum a row or column, click on the line in front of a row or column typing in the appropriate number. Or ask two volunteers to play a round for the class and record their game on the board. Then students should then play the game in pairs. Students should come up with their own methods for calculating the total of each row.